Since time immemorial, humans have been searching for the answer of how the Universe came to be. However, it has only been within the past few centuries, with the Scientific Revolution, that the predominant theories have been empirical in nature. It was during this time, from the 16th to 18th centuries, that astronomers and physicists began to formulate evidence-based explanations of how our Sun, the planets, and the Universe began. When it comes to the formation of our Solar System, the most widely accepted view is known as the Nebular Hypothesis. In essence, this theory states that the Sun, the planets, and all other objects in the Solar System formed from nebulous material billions of years ago. Originally proposed to explain the origin of the Solar System, this theory has gone on to become a widely accepted view of how all star systems came to be. According to this theory, the Sun and all the planets of our Solar System began as a giant cloud of molecular gas and dust. Then, about 4.57 billion years ago, something happened that caused the cloud to collapse. This could have been the result of a passing star, or shock waves from a supernova, but the end result was a gravitational collapse at the center of the cloud. From this collapse, pockets of dust and gas began to collect into denser regions. As the denser regions pulled in more and more matter, conservation of momentum caused it to begin rotating, while increasing pressure caused it to heat up. Most of the material ended up in a ball at the center while the rest of the matter flattened out into disk that circled around it. 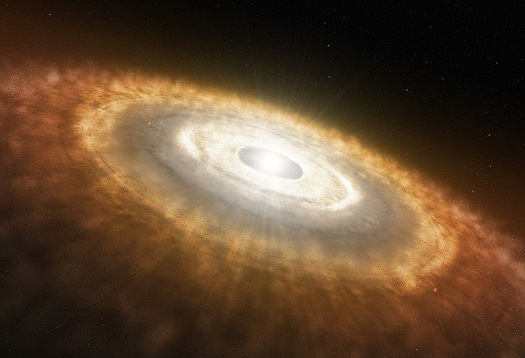 While the ball at the center formed the Sun, the rest of the material would form into the protoplanetary disc. In contrast, the giant planets (Jupiter, Saturn, Uranus, and Neptune) formed beyond the point between the orbits of Mars and Jupiter where material is cool enough for volatile icy compounds to remain solid (i.e. the Frost Line). The ices that formed these planets were more plentiful than the metals and silicates that formed the terrestrial inner planets, allowing them to grow massive enough to capture large atmospheres of hydrogen and helium. Leftover debris that never became planets congregated in regions such as the Asteroid Belt, Kuiper Belt, and Oort Cloud. Within 50 million years, the pressure and density of hydrogen in the center of the protostar became great enough for it to begin thermonuclear fusion. The temperature, reaction rate, pressure, and density increased until hydrostatic equilibrium was achieved. At this point, the Sun became a main-sequence star. Solar wind from the Sun created the heliosphere and swept away the remaining gas and dust from the protoplanetary disc into interstellar space, ending the planetary formation process. The idea that the Solar System originated from a nebula was first proposed in 1734 by Swedish scientist and theologian Emanual Swedenborg. Immanuel Kant, who was familiar with Swedenborg’s work, developed the theory further and published it in his Universal Natural History and Theory of the Heavens (1755). In this treatise, he argued that gaseous clouds (nebulae) slowly rotate, gradually collapsing and flattening due to gravity and forming stars and planets. A similar but smaller and more detailed model was proposed by Pierre-Simon Laplace in his treatise Exposition du system du monde (Exposition of the system of the world), which he released in 1796. Laplace theorized that the Sun originally had an extended hot atmosphere throughout the Solar System, and that this “protostar cloud” cooled and contracted. As the cloud spun more rapidly, it threw off material that eventually condensed to form the planets. The Laplacian nebular model was widely accepted during the 19th century, but it had some rather pronounced difficulties. The main issue was angular momentum distribution between the Sun and planets, which the nebular model could not explain. In addition, Scottish scientist James Clerk Maxwell (1831 – 1879) asserted that different rotational velocities between the inner and outer parts of a ring could not allow for condensation of material. By the early 20th century, the Laplacian model had fallen out of favor, prompting scientists to seek out new theories. However, it was not until the 1970s that the modern and most widely accepted variant of the nebular hypothesis – the solar nebular disk model (SNDM) – emerged. Credit for this goes to Soviet astronomer Victor Safronov and his book Evolution of the protoplanetary cloud and formation of the Earth and the planets (1972). In this book, almost all major problems of the planetary formation process were formulated and many were solved. For example, the SNDM model has been successful in explaining the appearance of accretion discs around young stellar objects. Various simulations have also demonstrated that the accretion of material in these discs leads to the formation of a few Earth-sized bodies. Thus the origin of terrestrial planets is now considered to be an almost solved problem. While originally applied only to the Solar System, the SNDM was subsequently thought by theorists to be at work throughout the Universe, and has been used to explain the formation of many of the exoplanets that have been discovered throughout our galaxy. Although the nebular theory is widely accepted, there are still problems with it that astronomers have not been able to resolve. For example, there is the problem of tilted axes. According to the nebular theory, all planets around a star should be tilted the same way relative to the ecliptic. But as we have learned, the inner planets and outer planets have radically different axial tilts. Whereas the inner planets range from almost 0 degree tilt, others (like Earth and Mars) are tilted significantly (23.4° and 25°, respectively), outer planets have tilts that range from Jupiter’s minor tilt of 3.13°, to Saturn and Neptune’s more pronounced tilts (26.73° and 28.32°), to Uranus’ extreme tilt of 97.77°, in which its poles are consistently facing towards the Sun. Also, the study of extrasolar planets have allowed scientists to notice irregularities that cast doubt on the nebular hypothesis. Some of these irregularities have to do with the existence of “hot Jupiters” that orbit closely to their stars with periods of just a few days. Astronomers have adjusted the nebular hypothesis to account for some of these problems, but have yet to address all outlying questions. Alas, it seems that it questions that have to do with origins that are the toughest to answer. Just when we think we have a satisfactory explanation, there remain those troublesome issues it just can’t account for. However, between our current models of star and planet formation, and the birth of our Universe, we have come a long way. As we learn more about neighboring star systems and explore more of the cosmos, our models are likely to mature further. We have written many articles about the Solar System here at Universe Today. Here’s The Solar System, Did our Solar System Start with a Little Bang?, and What was Here Before the Solar System? For more information, be sure to check out the origin of the Solar System and how the Sun and planets formed. 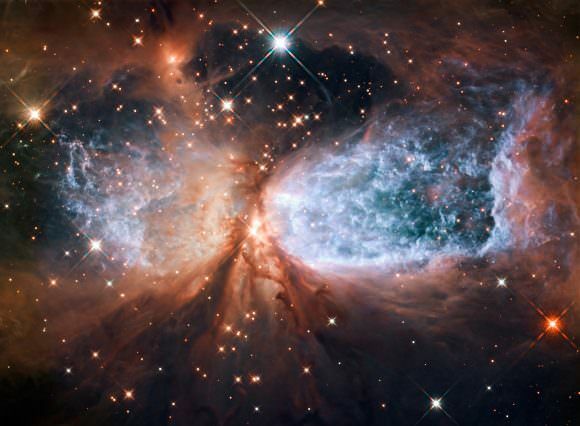 Astronomy Cast also has an episode on the subject – Episode 12: Where do Baby Stars Come From?